Is there a pair of alien species, one in Star Wars, one in Star Trek, that are too similar for coincidence? One from Star Wars IV: A New Hope, the other from Star Trek III: The Search for Spock. They look like the same actor to me. Are these guys the same guy? Miller's filmography does not include Star Wars Episode IV: A New Hope. Usually, IMDb filmographies include uncredited roles; that being said, these filmographies are not always complete or 100% accurate. 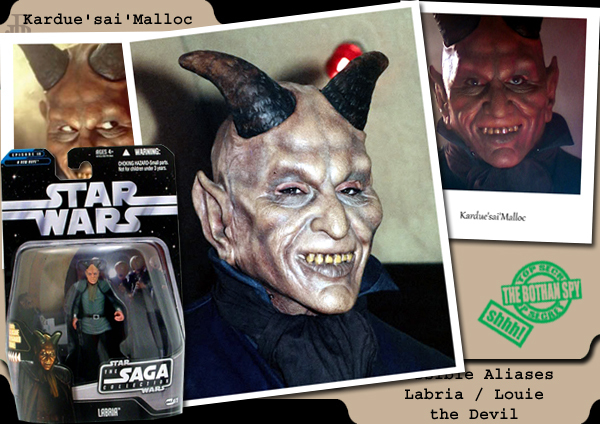 Turning to the character of Kardue'sai'Malloc (aka "Labria") in A New Hope, it is somewhat of a mystery as to who plays this "devil". 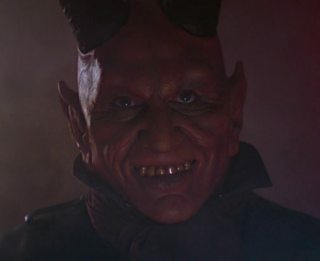 It is widely known that he was inserted into the scene at the last minute, because costume designer Rick Baker happened to have a devil mask on hand that he liked. For the record, Tippett played Doikk Na'ts in the Cantina band. According to Allan Miller's filmography linked above, he worked exclusively in television until 1977. His first credited film role was in MacArthur (1977) — interestingly, the same year as SW:IV. However, production on SW:IV was based at two studios (Elstree and Shepperton) in the UK, with filming locations in Tunisia, Guatemala, and Arizona. the interior of the Mos Eisley scene was filmed at Elstree Studios in the UK. In the years 1976-1977, Allan Miller was filming various TV series in California as well as MacArthur on a Universal Studios lot in California. Given his demanding TV schedule (appearances in several series at once), all in the Hollywood area, it seems very unlikely that Miller would have travelled to the UK to be part of the Cantina scene there. He also had no family or personal connections that would have brought him to the UK for other reasons. 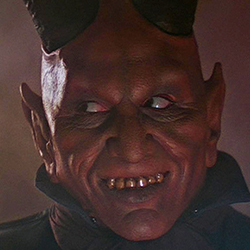 Based on the information above, there is no evidence that the bar alien in ST:III and the Cantina devil in SW:IV are played by the same actor. Rather, the timing, locations, and anecdotes suggest that they were almost certainly played by different actors. Here is a better picture in which you can see it is certainly a mask and bears little resemblance to Mr. Miller. It isn't unreasonable to think since SW was released in 1977 and STIII in 1984, the character design might have been an influence but it is almost certainly not the same person. Consider also that Miller is primarily an American actor and A New Hope was shot in the UK (of course there were American actors there - that isn't my point) - the point being that by all accounts this was a throwaway character added in at the last minute to give the scene more 'character'. It is unlikely it would have been a casting call type part and there is no indication that Miller was in the UK or Star Wars. 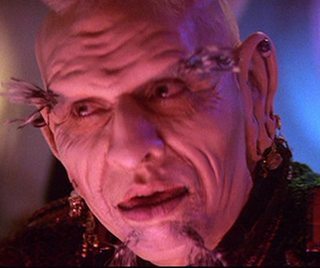 We already know that the Star Trek alien was played by Alan Miller, the real question is just who played Labria in Star Wars. This is an interesting issue because no one really seems to know for absolute sure. 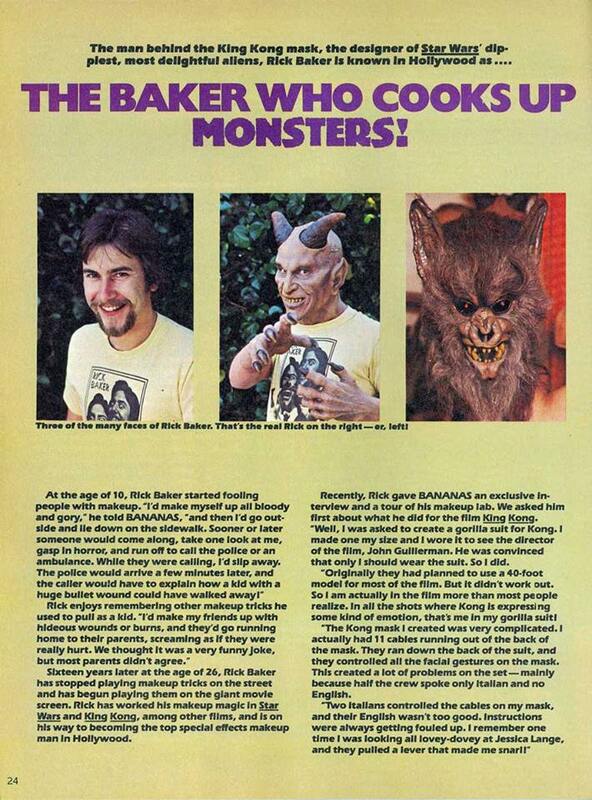 Amongst the community of Star Wars BTS-uber-fans, the consensus is that it is most likely Rick Baker, as it was Baker's mask that was used, and Baker is known to have donned a few masks for various pickup shots in the Mos Eisley Cantina. But for some reason, no one has been able to verify whether or not Baker in that specific mask. The most conclusive evidence we have is an old article about Baker, which includes a photo of him wearing the mask in question. The eyes between Baker and the on-screen actor look similar, but it's pretty hard to say for certain, and the article doesn't mention him wearing it on-screen. I asked about this in a Facebook Group whose membership includes not only extremely knowledgeable fans, but many people who worked on the films. 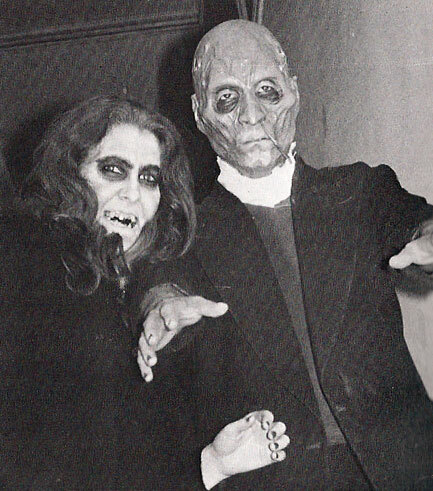 In addition to the Rick Baker theory, a member related some information that they had found. 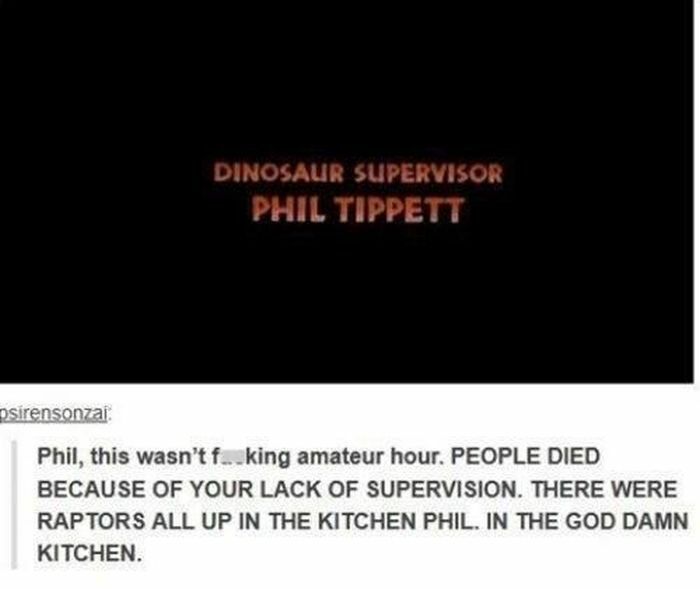 Apparently, at one point, Phil Tippett mentioned a part-time librarian at ILM named Jibralta Merrill being one of the faces behind the masks in the Cantina. 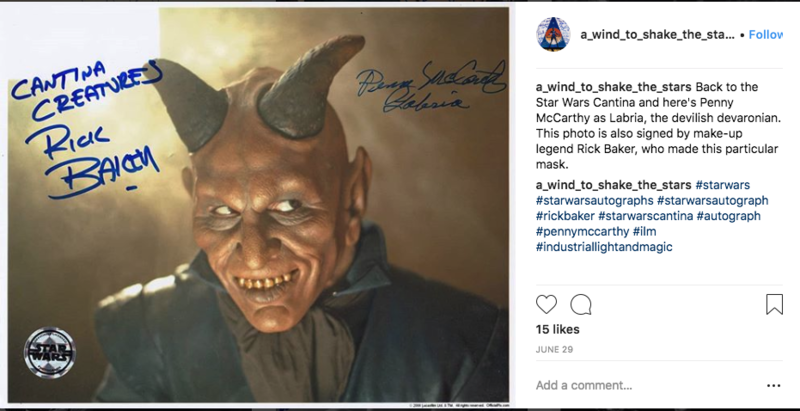 Supposedly according to her, Penny McCarthy was the person wearing the Labria mask in the Cantina. Apparently, Kardue'sai'Malloc was portrayed by a lady called Penny McCarthy, who was an auditor at Lucasfilm or Fox. Not the answer you're looking for? Browse other questions tagged star-trek star-wars a-new-hope actor-identification the-search-for-spock or ask your own question. Who are these characters in Star Wars Rebels? Are there any gay characters in Star Trek? Did any Star Trek actor play both a Starfleet crewmember and one of the encountered aliens? How did they choose exactly same looking young actors in “Star Trek” (2009)? Did the heroes in “Rogue One” bump into Ponda Baba and Cornelius Evazan, from the Mos Eisley cantina? Are there any “classic” species in Disney-era Star Wars movies?